A number of overseas bikers made their way to the United Kingdom last weekend to support the thousands of British motorcyclists who stood up against a parking tax imposed on them in Central London by Westminster City Council, without justification and despite 8,000+ written objections made by the public. The bikers took over the London Orbital M25 motorway on Saturday 19th June 2010 during six consecutive hours to express their anger and disgust at Westminster City Council’s motorcycle parking policy, on a national scale (click here to read more). Thousands of British bikers were delighted to welcome Frédéric to the UK for the occasion, who not only represented the very famous and respected Fédération Française des Motards en Colère (FFMC – French Federation of Angry Bikers), but also made his way to Britain to show the extent to which the French biking community was deeply opposed to Westminster’s motorcycle parking tax. Frédéric flew all the way to London from Marseille in Southern France with low cost airline easyJet. Upon arrival at Marseille airport, Frédéric was told by airline check-in staff that he could not take his helmet with him on board. Frédéric desparately needed his helmet to be able to ride the bike that had been booked for him at Metropolis in London to attend the protest on the M25 motorway. While UK France bikers.com strongly support the concept of low cost airlines where some services are excluded from the ticket fare to keep it as low as possible, and also strongly support easyJet as an airline that treats their passengers far much better than any other low cost airline, we are of the opinion that it was totally unacceptable and unjustified to decline Frédéric’s helmet on board the aircraft. Why was Frédéric allowed to take his bike heavy leather jacket with him and not his helmet? A helmet is a piece of safety equipment that is essential to ride a bike, it forms part of a biker’s clothing gear, so why on earth did easyJet not allow Frédéric to carry his helmet with him? A helmet is not a gun, a knife or a weapon of any kind, so frankly, what’s the problem? Surely, a helmet can go through airport security like any other item, can’t it? When we see how airport staff treat checked-in bags and suitcases by throwing them all on top of each other and packing them in planes like sardines in cans, checking in Frédéric’s helmet was definitely not an option. If a helmet falls down or receives a bad shock, it is good to go to the bin, so there is no way this type of item can be checked-in with the rest of your luggage. Needless to say that with those money-grabbing airlines, which force you to pay extra for every bag you check-in, Frédéric would have been obliged to pay an additional fee just to check-in his helmet, with no guarantee whatsoever that it was going to be treated with care throughout the journey. Considering that the easyJet flight from Marseille to London Gatwick took off 1 hour and 40 minutes later than scheduled, one can only understand Frédéric’s increased anger and frustration. Thank God, not all companies treat their customers so badly. Metropolis, the motorcycle dealer from whom Frédéric borrowed a bike for the weekend, was more than happy to lend him a helmet. This is another example of rules and policies set out by people who have not got the slightest clue about motorcycling. that is insane ! I was once refused petrol at a BP station if I didn’t take my helmet off. I refused and just went to buy my petrol at another petrol station. In the case of the flight there is not much one can do I guess but obey or loose the flight. It may be worth finding out from other airlines what the policy is regarding bike helmets. EasyJet will not get any business from me! This is arbitrary, unjustified and discriminatory. A helmet is a legal requirement for riders and I doubt that anywhere in an airline’s literature is there anything prohibiting the carrying of a helmet as hand luggage. THank you for your support Frederic: I regret that this Mickey Mouse airline treated you so shabbily and I hope that you elicit an apology. With Easyjet the only hand luggage you are permitted to take on board must fit into the “sizing cage” at check-in. I surmise that the crash helmet would be too wide for the prescriptive dimensions even if you were carrying nothing else. 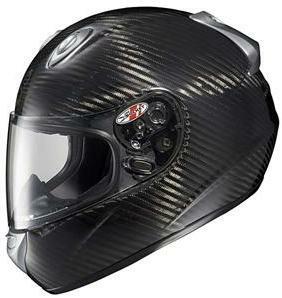 Having already arranged a scooter hire in Italy this summer I proposed taking my “skid-lid” with me but in view of Frédéric Jeorge’s experience I’ll rent/buy one when I’m there. I asked Easyjet about taking the crash helmet on board as hand luggage & I was told this was OK but I rather suspect that the Easyjet adviser was unfamiliar with this type of hand luggage. I often fly carrying a helmet as well as my hand baggage and the only trouble I ever had was at Luton with Easyjet where they said the same thing, it was too big to fit in the guide so had to be checked. I managed to get them to find their supervisor who fortunately had a sense of humour and when I pointed out somebody wearing a baseball cap, they agreed that I could wear my hat too. But that might not always work. BA, Lufthansa, Air France, never a problem and the security guys don’t care so long as it’s x-rayed. In fact in France, or at least Toulouse, there’s always a biker on security anyway. I wont travel any other way but BA never had a problem with taking helmet on board even joked with checkin that if I knew the plane was going down I’d put in on at least I’d know that part of me would be intact. (Gruesome I Know). I also always put my lid in its bag and slung over shoulder some people dont even question what it is and whats to stop me putting under seat in front as suggested for stowing.